Everyone who works with Ruby probably knows that this language originates from Japan. No surprise that the idea of a human-friendly programming language appeared in the country of Zen. Also, that RubyKaigi, the biggest Ruby conference is being held in one of the Japanese cities each year. This May and June it was Sendai, and I was lucky to be nearby! Without hesitation, I decided to go there and attend this most prestigious Ruby event. First of all, Sendai. It is a city in the northern part of Japan, over 300 km from Tokyo. Early morning I took a Tohoku Shinkansen (a railway line between Tokyo and Shin-Aomori in case you don’t know) and within one and half an hour I arrived at the Sendai Station. The conference was in Sendai International Center where you can get directly by taking a Tozai Line, but I still had time, so I just walked there. The city itself is clean and harmonic. Especially I loved the aisle full of trees I was walking on. It was not so far actually. Within 30 minutes I got there, to notice first people with laptops in a local park. Also, there was a nice Sendai City Museum nearby to visit in free time. All right, but have you wondered what does Kaigi mean? The most correct English translation for this word is 'a conference', so now it makes sense why the whole event is called the way it is. You do not have to speak Japanese, even though most speeches were not in English. The conference was organized as perfectly as a good Ruby code, so real-time translations were available all the time. 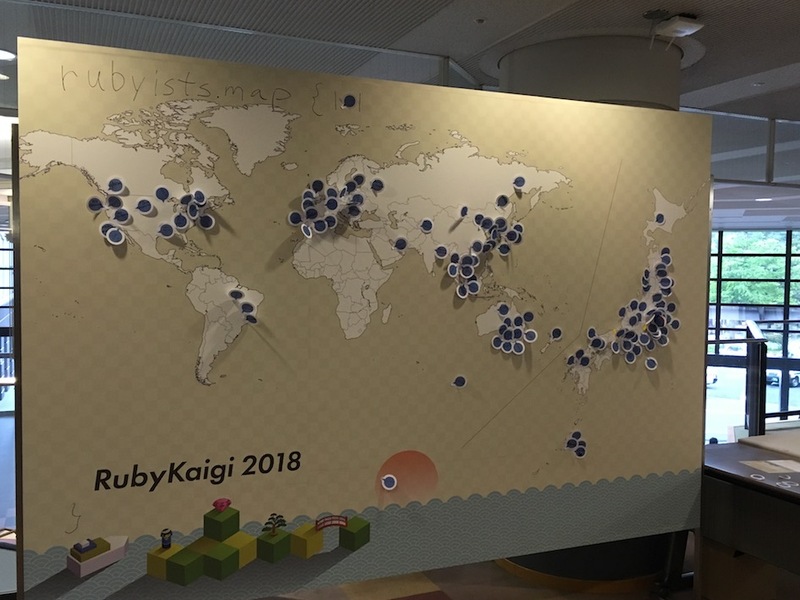 Over 1,000 Rubyists from all around the world made up for a great international character of the event, a place to exchange experience and spread new ideas. Just take a look at the map! It may look funny, but contrary to most technical conferences, this one was fully focused on technical topics. So no, there were no coach speeches, only those purely practical ones. And even if you were not familiar with some topic, you could choose another one out of three parallel speeches in nearby halls. The flip side of it was of course that you often had to choose between two great topics. Because who wants to miss a talk by the most important people in the Ruby world? Only twice a day there were no such problems: during the first opening keynote and ending events when everyone gathered in the biggest hall. If you were lucky you could bump into many events that where not announced. One of them was a live pair programming session with Matz. The idea was to make a game of life and see how the creator of Ruby would make it in Ruby. What I have noticed, is that he is more into old solutions. Well, bearing in mind that creating Ruby requires more work in C than in Ruby, then maybe it makes different habits than by someone who works only in Ruby? It is just a hypothesis, what do you think? :) In case you want to learn about the pros and cons of pair programming, be sure to check out our extensive guide on that topic! But conferences are not only about listening to one person talking. It is about networking and getting to know all the great people around. At RubyKaigi, I had a chance to meet the best influencers in the Ruby world in the short time between speeches sessions and then meet again during a delicious bento dinner or parties before and after conference! The variety was big enough to make one confused where to go, and wherever I went, I experienced the real Japanese Omotenashi (hospitality)! It was not only a great moment to make new contacts, but also become part of a great community of people who may be potential business partners in the future. I am convinced, that when I come to the RubyKaigi next year, I will feel like back among good old friends. See you next year in Fukuoka! The next RubyKaigi is scheduled for April 18 - 20, 2019 in Fukuoka. If you are wondering about taking part next time, you definitely should! There is no doubt, it is worth traveling from any place on the globe to attend the event where you can meet best Rubyists from all around the world. 2019 is full of cool tech events. Check them out! Apart from RubyKaigi, we know about a lot of cool technology events already scheduled for 2019. As the tech industry is a vast one, they all are going to cover a variety of topics ranging from AI, cybersecurity and telehealth to gaming, SaaS market, growth and hyperscaling among others. Each of them is not only a good way to discover the future of the tech, but also a perfect opportunity to find business partners. We have selected the most interesting events out of those announced so far. If you want to make some plans, grab your calendar and check our guide to the tech events in 2019 you definitely don't want to miss. As more details and new events are revealed, the guide will be updated regularly.